Star Trek Voice Operated Dimmer | OhGizmo! I’m not really a Trekkie per se but I can appreciate the convenience of having a computer at your beck and call like they did on the TV show. Now while the technology used in this Star Trek themed voice dimmer is a few light years away from the one they used on the Millennium Falcon Enterprise it is the cheapest solution you’re going to find on the market today. And given anyone seriously considering this probably lives in their parent’s basement cost is an important factor. 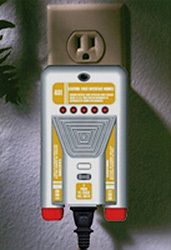 Usage is pretty straightforward, you basically plug the unit into a wall socket and then plug your lights into it. After a short training session you’ll be able to control the light with simple voice commands like “Computer! Lights at 50 percent!” and so forth. Of course to accurately recreate the whole Star Trek experience the dimmer will even respond in the voice of Majel Roddenberry who voiced the ship’s computer in the TNG series. The Star Trek Voice Dimmer is available for $39.95 from VOS International.